When planning a wedding, it does get stressful. As a former bride and current wedding service vendor, I can personally attest to this! There are so many aspects of planning a large event and lots of DON’Ts, but you shall not fret, I’ve also included a full list of DOs to go with those. Always go into your vendor meetings with an open mind, as you may be happy to learn something you haven’t accounted for, or other alternatives to fit your needs. DON’T plan for a buttercream cake at an outdoor wedding in the middle of summer! Not only can it lead to disaster, but it can leave you without a cake for your guests. DO account for heat, location (i.e. beach- no one wants sand in their icing), and time of day for the wedding. If your event is at a fully outdoor location, discuss a later delivery with your cake artist to ensure the cake stays cool until needed. For events with both indoor and outdoor space, discuss options such as holding the cake cutting indoors in order to preserve its integrity. DO remember that this is Texas, y’all, and butter will absolutely melt when left outside for too long. If you must have a fully outdoor event with no safe space for the cake, you can always try for a later evening event where the sun isn’t out, or have your cake cutting towards the front of your timeline. DON’T take the sketch from one artist to another bakery! If you are visiting with a cake designer and eventually choose to not go with them, do not take their sketch (if you’re either emailed or given one on paper) to another cake artist and ask them to replicate it. As artists, we do work hard to create unique pieces of edible art for our clients, and our ideas are our own. Many designers won’t even look at a sketch that was created by someone else. Instead, DO discuss the elements that you like and would want to have on your cake to create a new design for your needs. Not only does this look poorly on involved parties, there are a multitude of intellectual property/ethical issues included. DON’T assume that a certain design is cheap! Naked or textured buttercream cakes (also called “rustic buttercream”) do not equal sloppy cakes. Yes, there may be less intricate elements on these styles, however, it does take more careful planning and execution to get crisp, clean lines. Even if you don’t prefer the smooth finish of fondant or a smooth buttercream, your cake should not be lopsided or sloppy. Perfectly level tiers, stacking, and crisp corners still take TIME. DO your research and look at the quality of work in this particular style when choosing a vendor. Just because the price may be cheap, does not always equate great quality. Also, DO ask questions on how you can work part of your vision into your budget if the design you dream of doesn’t align with your financial status. DON’T insult or demean your cake artist over their prices! 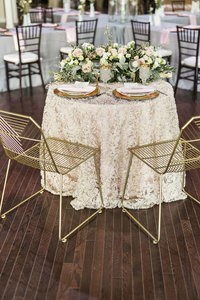 If you have a vision in mind for five tiers with ornate decoration, and your budget does not allow, DO talk to your artist about how you can compromise to possibly have some elements while stating in your budget. Also, DO your research prior to meeting with your cake designer. Knowing their price range ahead of time and seeing what you can afford will ensure that neither party’s time is wasted. You wouldn’t want to design your dream cake and have your heart broken when you later find out that it’s outside of your range. DO be honest with your vendors when it comes to budget; it only benefits everyone involved. DON’T compare apples to oranges. If you envision Design A: large and intricate yet cannot afford it, that’s fine; be honest. It’s perfectly okay to go with Design B: smaller and understated/minimal décor. That said, DON’T compare the prices of Design A and Design B from two different artists… you will not get a true result. I’ve had this happen before. The bride comes in and we design her large cake with intricate decorations and handmade pieces, the price was more than she could account for. She chose another person to bake her cake and opted for a similar (slightly smaller) size and much more limited décor and nixed the sugar flowers. Had she discussed the flexibility in design requirements, I could have still assisted her for her event. DO be flexible in some way: if you are set on a size/design, you may have to flex your budget; if you’re set in budget restraints, you may have to flex on design and come to a realistic compromise to fit your needs. DON’T be ashamed to get a cake from a big box store! I don’t know about you all but I have had fun this month learning about wedding cakes. I hope this information helped all of you, and if you find yourself still needing questions answered, feel free to reach out to us as we would love to help you in your planning journey. I’d like to thank Jenna of Sinfully Sweet again for taking the time to share all the nuggets of information.